This indicator determines minimum volumes needed during a candle formed so that it would be higher than current volume's average. Although you can place MAs on your volume indicator, this indicator has non-repaint characteristic so you may not to worry about sudden volume increase. This indiator also draw volume indicator for its own. period: Period used for indicator. Must be higher than 1. VolumeXover: This indicator's main feature. During the time the volume indicator is higher than this line, the volume on that candle is higher than current volume's average. Depicted in dotted yellow line. 2 Volume values: These are needed to draw volume histograms. 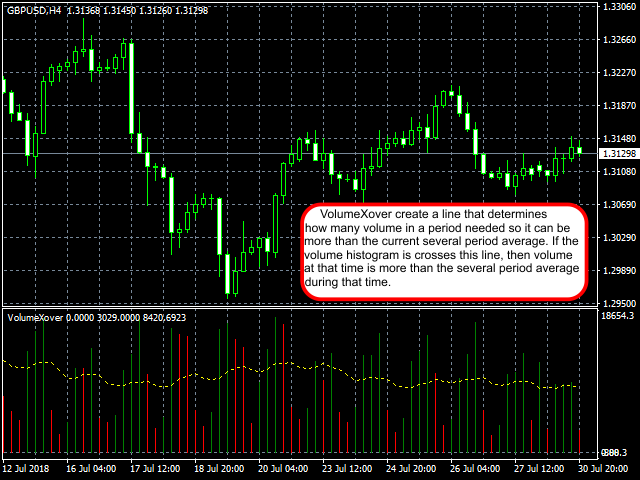 Works like a MT4's default Volume indicator.